Sometimes we luck out and we find exactly what we need when we need it. It doesn’t often happen that way. Actually it usually doesn’t happen that way. When I decided that I wanted to spray paint glass vases as accessories in my kitchen I thought I’d try to shop my stash first. So I went out to my storage greenhouse and, lo and behold, what did I find? 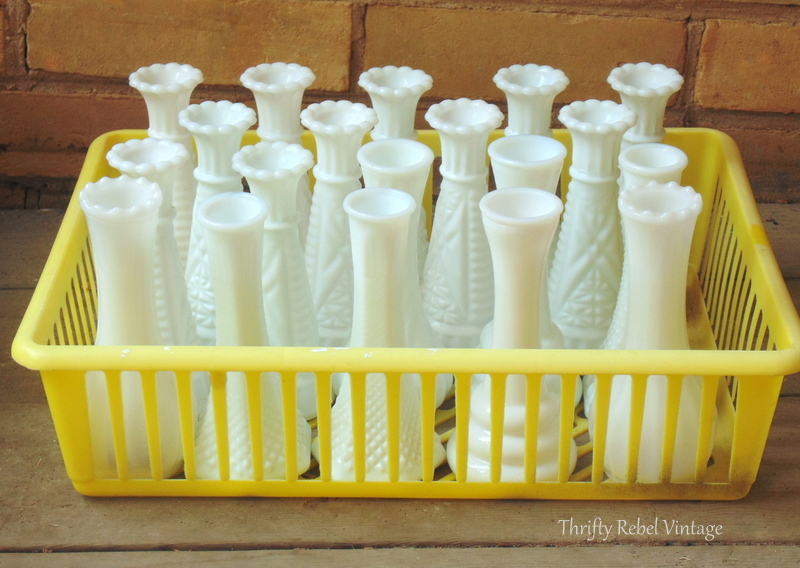 This collection of 20 small milk glass vases. Great score! And in my own storage. Who knew? Apparently, not me. lol. I’ve had these for years and completely forgot about them. Can you believe I got the whole lot in this basket for just $2? It’s totally true! It was years ago, and I totally forgot I even had them. I just plunked the whole kid and kaboodle on a shelf for a some day project and some day never came. Until now that is. Some are marked Randell, & E.O. Brody Co, but most are unmarked. Here’s that vase that was so anxious to get its makeover. 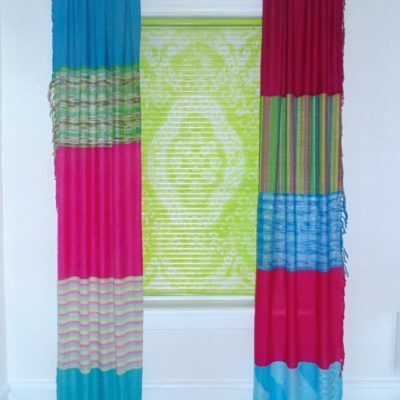 I had twelve of this one design, which is unmarked, and I only needed eight for this project. Because there’s a lot going on in my kitchen, decoratively speaking, I decided to keep it simple and use all the same vase design. I could easily have mixed it up but that’s just not the look I was going for. Also, I would have preferred to use matching clear vases for this project, but I use what I have when I have it. Since I got these vases for such a great price, and they aren’t rare by any means (they can be found for sale all over etsy), it’s all good. 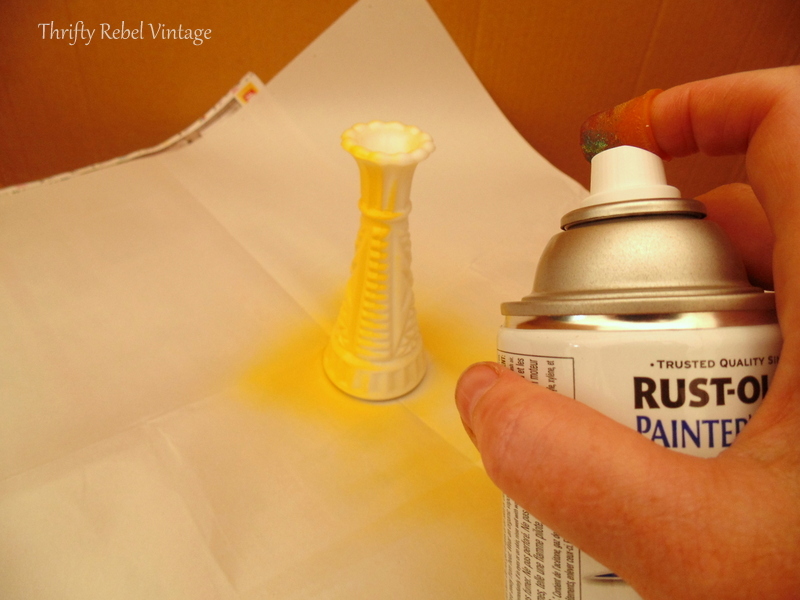 Following the instructions on the can I gave it a two light coats of Rustoleum Sun Yellow. 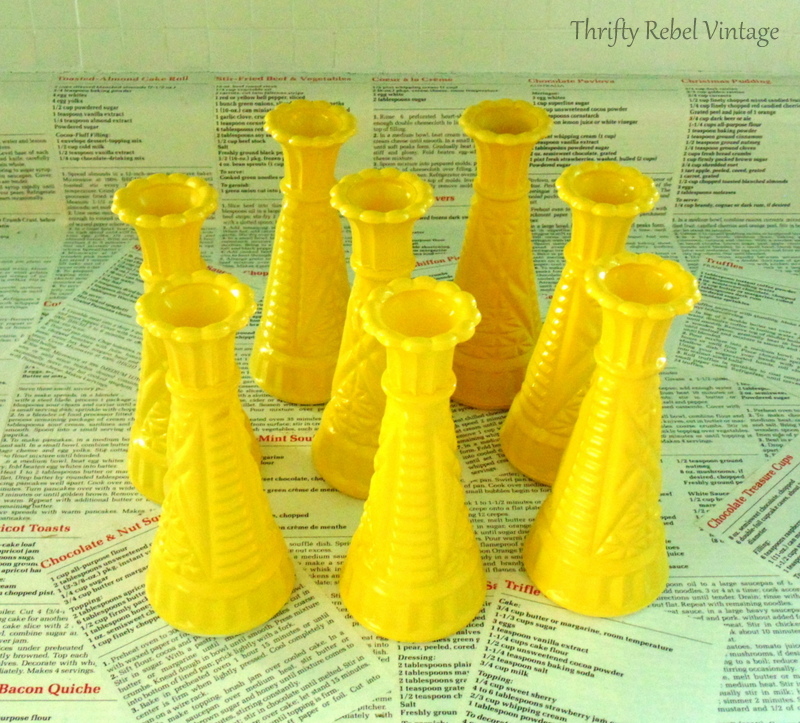 I’m excited to be introducing a third colour into my aqua and red kitchen redo, and that colour is a happy sunny yellow. A third colour that’s just sprinkled here and there seems to give a room more interest, another dimension… in this case a third dimension. 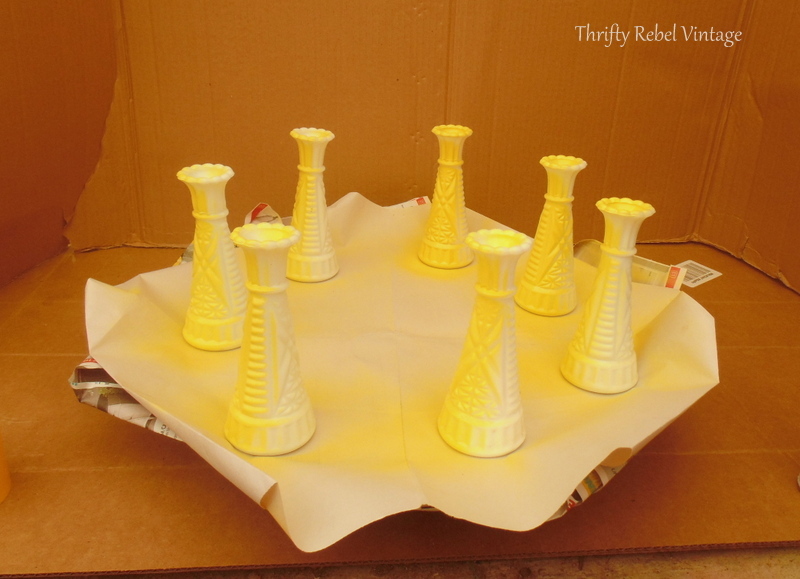 Using my 10 must-know spray painting tips, which you can access at the bottom of this post, you’ll be able to spray paint some vases quickly and easily..
…or space them apart and paint them all at the same time. Until they’re done. Easy peasy. 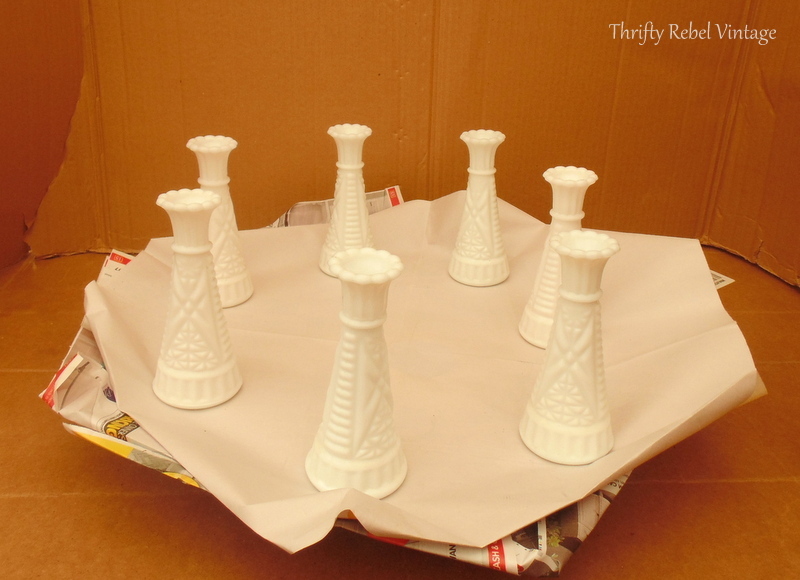 Here they are on my decoupaged kitchen counter waiting to be filled with something awesome. 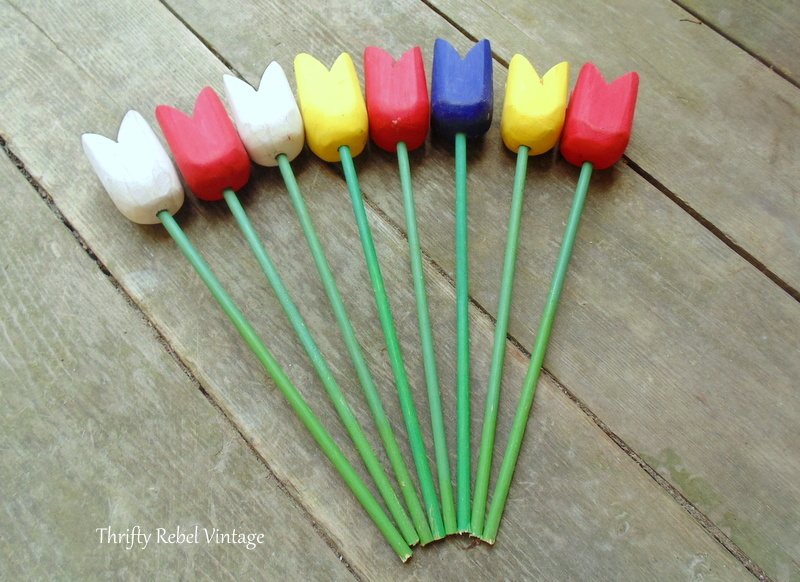 Like this $1 wooden tulips bunch that I shared in a finds post a while back. 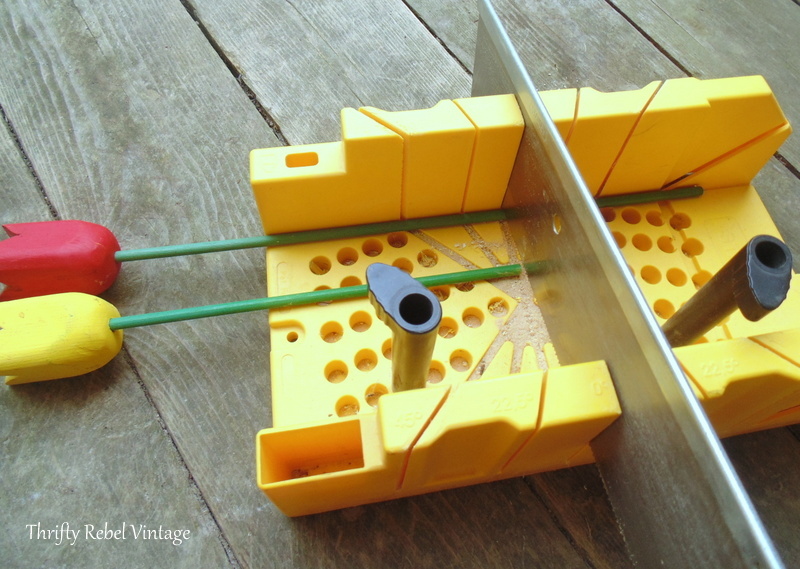 They were all various lengths so I used my mitre saw and box to trim them, using one as a guide. I wanted them to be all the same height when sitting in the vases. 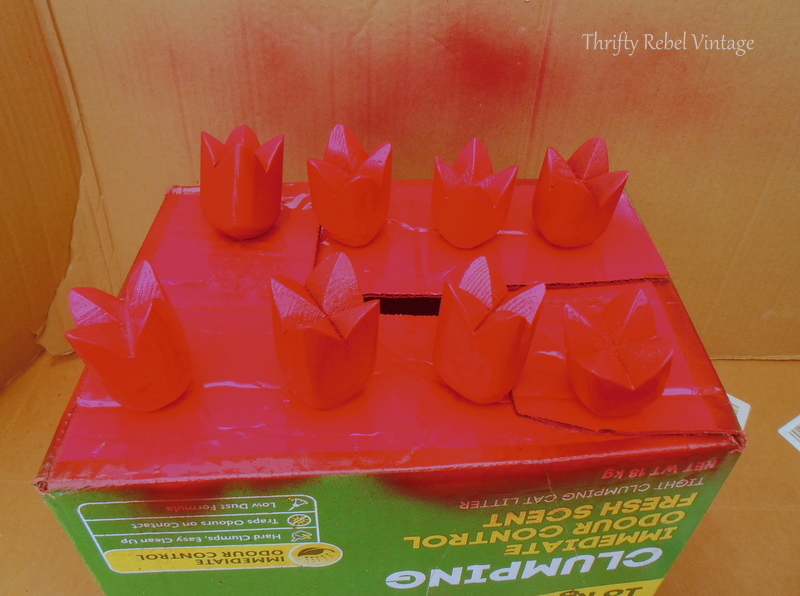 To give them all some red spray paint love I poked holes into a cardboard box and pushed them through, including the red ones because I wanted them all to be the same red. 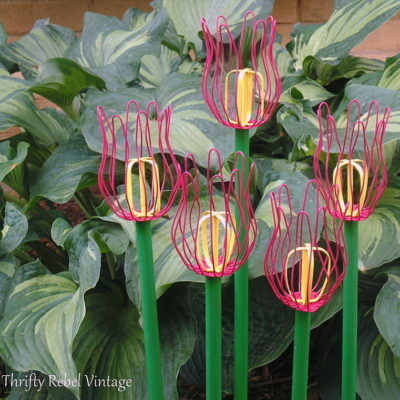 This way the green stems would be protected without having to tape them. Except for the dark blue one, which needed 3 coats, I gave them all two light coats of Rustoleum Apple Red. 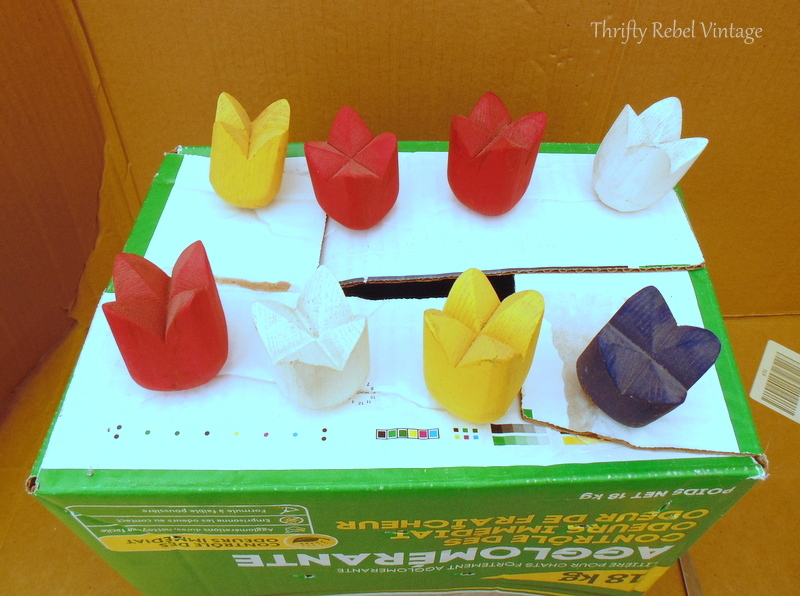 And here they are… my indoor garden of wooden red tulips. This was such a fun project. 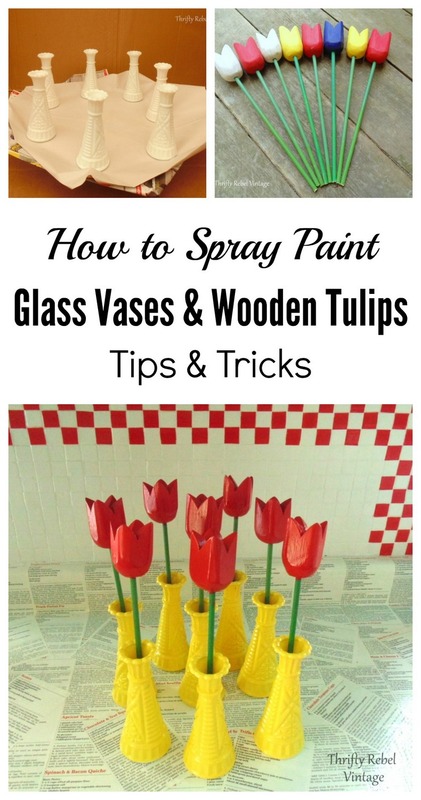 It’s so easy to spray paint glass vases, and you can make them any colour that suits your own decor. 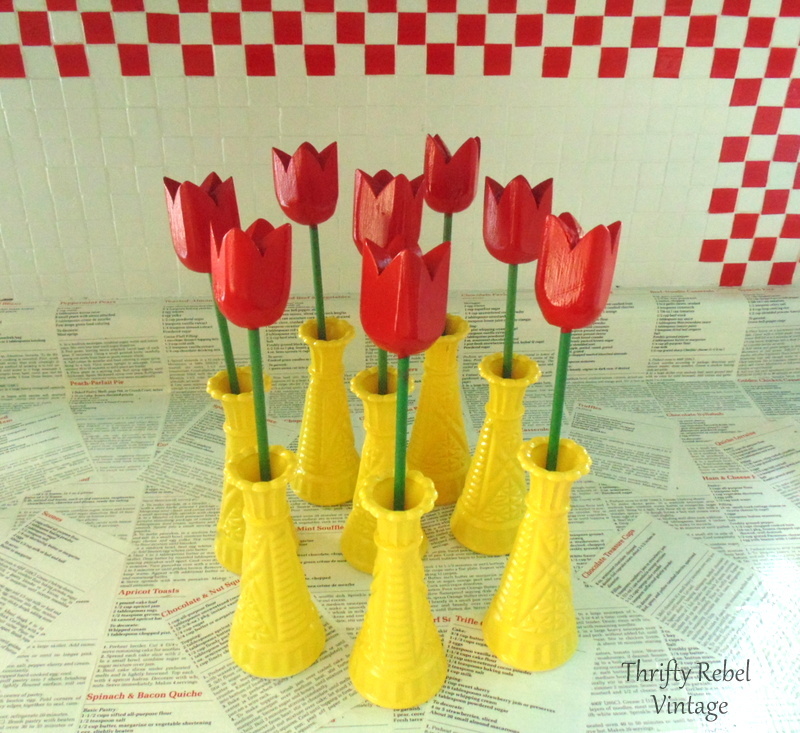 For me the red tulips with the yellow vases is such a happy cheerful combo. Here they are in my kitchen. This is the area above the sink and those shelves have always been kinda useless and just attracted clutter and odds and ends. I’m a symmetry-loving gal and repeating the same look on each of the shelves keeps it looking neat and tidy, but fun at the same time. Having different things on each shelf would make them look too busy for my liking. Now they make me smile every time I do the dishes. No dishwasher here. So I definitely needs things to make me smile. lol. 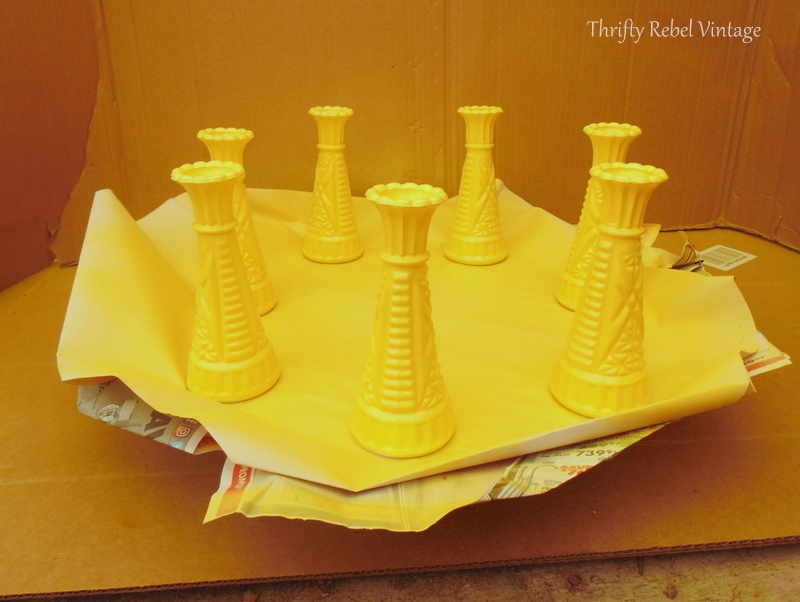 Yellow is such a fun colour to work with, and I’m planning to sprinkle a few more yellow projects around the room to give it a cohesive look. You can access this free printable in my Resource Library by filling out the form below. 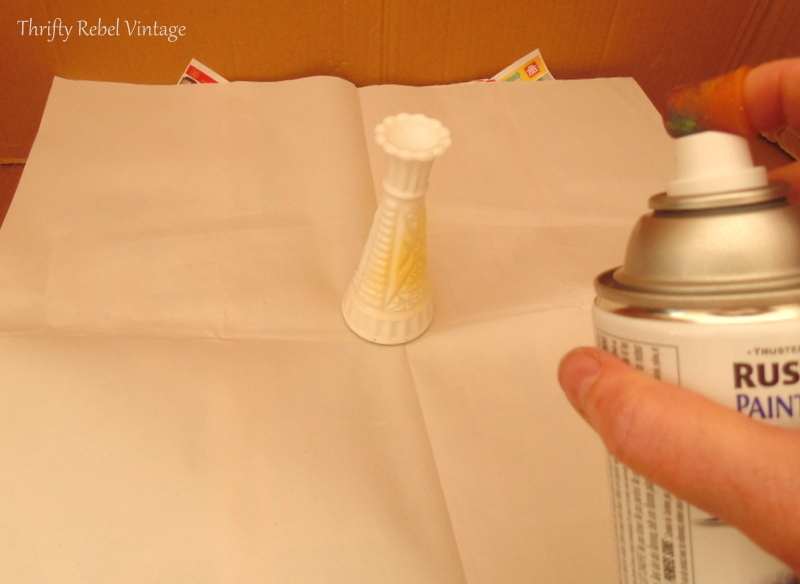 If you enjoyed this post you might also enjoy my How To Spray Paint Ombre Vases post. “Your idea fits your kitchen theme, but we need a photo of them placed around…the whole effect. Your methods and instructions are very clear, esp. for anyone who hasn’t done any projects like this. I usually forget something I’ll need, right before I need it, then I can’t find it. That could be called “organize before you start”. You did a great job. Thanks very much Mary! The shelves have always been a bit of a challenge, but now I’m happy to have found a solution that works for me. Love those cheerful pops of color & the vases & tulips! Looking forward to the final reveal! Thanks so much Florence! I’m enjoying adding some pops of yellow. It’s such a happy colour. Oh my goodness those are cute!! Thanks very much Tania! I’m so glad spray painting season is here. It’s so fun to transform things so quickly. 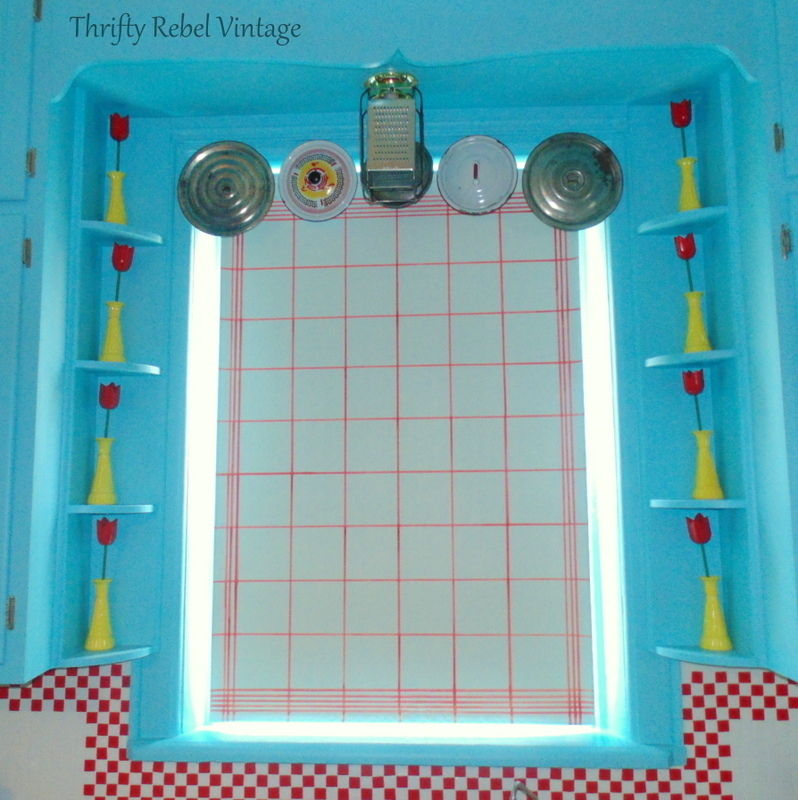 Great tutorial Tuula and your kitchen just keeps getting cuter, and cuter! Thanks for sharing @Vintage Charm! Thanks Cecilia! I never tire of how magically spray paint can give things a new look so quickly. Tuula, These are so stinkin’ cute! And I love the addition of yellow to your aqua and red kitchen! The symmetry is perfect, too. Great addition to the happy spot! Thanks very much Lora! Yellow is such a cheerful colour and it’s so much fun to work with. 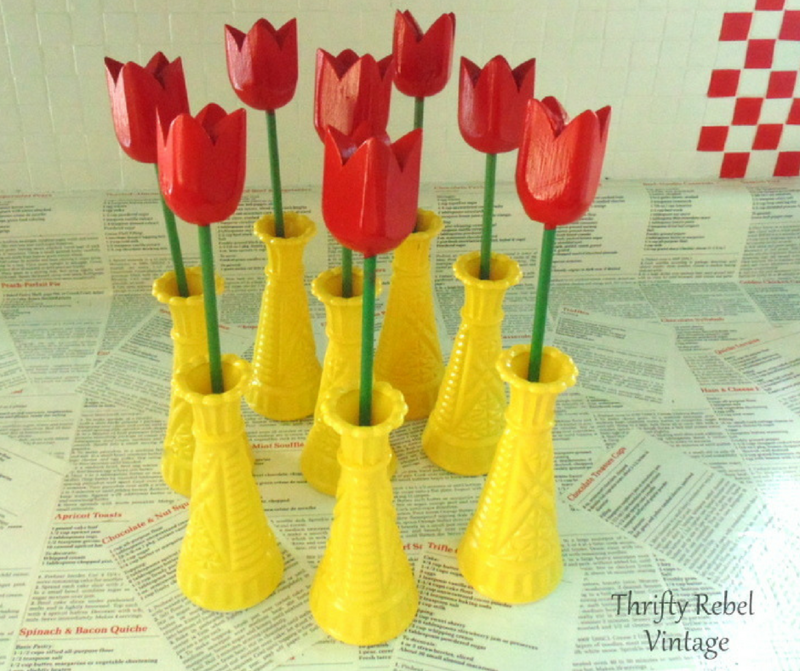 I love the red, green and yellow combination of the finished vases with the tulips. And I love that you introduced a third color into your kitchen. Beware, it may not stop there! My kitchen is cobalt blue and white with accents of hunter green. Slowly I have added red here and there and I love it! Fun project! Great idea to use the lazy Susan. Thanks for sharing with SYC. 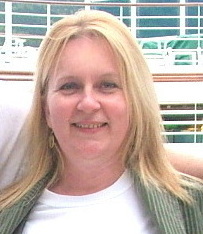 Thanks very much Jann! The lazy suzan really helps a lot when spray painting smaller things. Thanks Dona! I was struggling with what to do with those little kinda useless shelves, and these vases fit quite nicely.